It’s not Delhi alone struggling with air pollution. Based on data published on the World Air Quality Index website, Faridabad, Lucknow, Muzaffarpur, Agra, Pune and Rohtak too fall in the hazardous range. All these cities have an air quality index of greater than 300. The Air Quality Index is calculated based on PM2.5, PM10, Ozone, NO2, SO2 and CO levels as hourly measurements. This is a continuous monitoring system and values will vary on an hourly basis and in India they collect data from 62 centers. 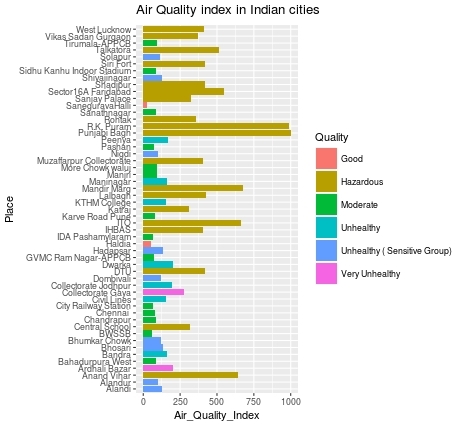 The surprising fact is that out of this 62 centers, Haldia in West Bengal and Saneguruvanahalli in Bangalore alone has good air quality index. Remaining all cities fall within moderate to very unhealthy range. Indeed scary. You can check data for yourself here. If Urban air pollution is the contribution of combustion of fossil fuels, In rural areas Household air pollution (HAP), is a serious area of concern. The main villains are particulate matter (PM), measured as particles which have an aerodynamic diameter lesser than 10 μm (PM10) and lesser than 2.5 μm (PM2.5), nitrogen dioxide, sulfur dioxide and ozone. It’s not that others are not harmful, mostly these four are measured as in indicator to determine air quality. The WHO guideline values for particulate matter are 20 μg/m3 for PM10, 10 μg/m3 for PM2.5, 40 μg/m3 for NO2 and 20 μg/m3 for SO2. NO2 is increasing at an alarming rate in Indian cities, thanks to increase in number of vehicles. NO2 is extremely detrimental to lungs. Exposure to NO2 over a period of one to three years increases incidence of bronchitis, emphysema and also adversely affects lung performance. Exposure to excessive NO2 affects the defense mechanism too. 80-90% of absorbed CO binds with Haemglobin and from Carboxyhaemoglobin. The scary fact is affinity with CO binds to Haemglobin is 200-250 times more strongly than that with oxygen. The symptoms of CO poisoning may include headache, dizziness, drowsiness, and nausea. At next stage vomiting and loss of consciousness is observed. If prolonged exposure continues, it may lead to coma or even death. Though PM2.5 is too small in size, it can cause an array of health problems, including premature mortality, chronic respiratory disease, asthma and decrease in lung function. Another critical point is that, it contains large proportion of metals and acids, and also it can penetrate into the respiratory tract deeper because of its size. Exposure to Ozone again can lead to bronchitis, emphysema and also adversely affects lung performance. The impact of ozone is all the more high on sunny days. Children are at high risk as their lungs are still developing. Also people with reduced intake of nutrients like vitamins C and E, are at greater risk from ozone exposure. SO2 is hygroscopic in nature. SO2 reacts with humidity and forms sulphuric and sulphurous aerosol acid. These acids are extremely hazardous as these compounds enter the circulatory system directly through the airways. SO2 can also irritate the skin and mucous membranes of the eyes, nose, throat, and lungs. Replace regular candles with Pure Beeswax Candles. These candles burns with almost no smoke or scent and clean the air by releasing negative ions into the air. These ions binds to toxins and remove them from the air. Use salt lamps made from Himalayan crystal salt. Negative ions released from them binds to toxins and remove them. One can leave the lamp on at night as well, since the natural orange glow won’t disrupt sleep hormones. They can work even if they are turned off . Houseplants can freshen the air within houses and workplaces, without any side effects. 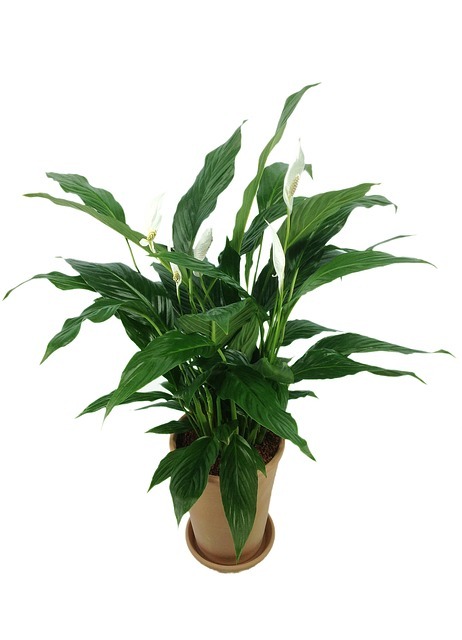 The best plants to filter toxins from the air are Peace Lily, Lady Palm, Aloevera or Broadleaf Lady Palm. Air Pollution is going to stay for ever. No one can reverse to good old days with clean air. Just that one need to decide on ways to protect from this danger. Loved your post…thank you for those amazing tips to help keep safe from pollution….only got to know about beeswax candles now…gotta try them ! I am a firm believer in power of Clean Air and plants as the rescuer .We need to spread awareness like this everywhere. Thx for sharing these amazing tips . It is very important to have Clean air & clean surroundings ! That’s such a useful post. I am so thankful to you for sharing this post. Pollution is one of the serious issues these days in India and you have stated this so well. Totally appreciate the tips mentioned here… Thank you.